Personally I think Kevin and the team have nailed it. 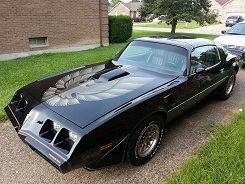 This is what a modern day Trans Am should look like. There are just a few small things that I would change, but overall the whole package works and is the design GM should have done. So a few weeks back Chevy runs some ridiculous rebates and I figure it is time to bite the bullet and go all out and get a 7T7 TA. So I go to the local dealership and get a car all lined up just the way I want it and call TAD. To my shock, the $30k price tag is now $42k for just the conversion!!! (No t-tops power adders- nothing else). It also includes design changes on the inside that I do not want. So I ask to just have the outside converted and they refuse to do it. Then they tell me that if I called a few months ago that I could have done it for $30k without the interior, but not now. So in al reality to get into a "base" 7t7 TA you are looking at $80-$90K based on the camaro you start with. And the conversion cost AS MUCH AS THE CAR! While they nailed the design, they missed the point, TA's weren't for the independently wealthy, they were for the everyday enthusiast. They weren't meant to be hidden in garages, they were meant to drive. Who is going to drive a $85k car to work and risk door dings? Great concept car, but not a car that TA enthusiasts can actually aquire. Is this thing fast? Oh Yeah! Re: Awesome car- wish I could get one! They must be really busy to turn away business. Being a custom one off shop you think they'd have the flexibility to do one the old way. nas t eh- I really don't think it was about the workload. It was about doing it their way. For instance the car I has lined up had the integrated back up camera in it and i didn't like the radio they have that is part of the mandatory package. I explained that I liked the stock one better and the response was that I could put it back in when they were done. Really? Make me replace a radio that is already in the car? Just didn't make sense. I asked why and they said that it was part of the package. So I wanted to buy the parts and do the work myself, but they will not sell fascia's, fenders, spoilers, or even decals to you unless you already own a car (and even at that the implication was that they would want to see an insurance claim so you don't buy extras). I can understand a manufacturer with a billion dollar assembly line not doing customization for every customer, but a small Custom shop not doing custom work, I just don't understand. Are they nice - I guess. Are they Pontiac's - no. Will I ever spent more to get one - no, why spend more on a Camaro. That was pretty much the sales model for the Firebird though. Sounds like this adds to the overall reason why there are not more of the Trans Am conversions out in the marketplace. I really think these would look better if they based it off a 1st gen car and I'd love to see someone go that route. Thats what the Camaro was supposed to be and I think the dimensions would work out better. Don't get me wrong I know theres a ton or work and stuff put into them and theres people that like them but it just looks kinda out of place to me. I've said the very same before, the 5th gen Camaro was a retro 1st gen not 2nd gen so why everyone bastardized them into a 2nd Trans Am is beyond me. Well, that way they could hop onto the Bandit sellout train. I for one like the 6th gen considerably more than the 5th gen, cut out most all of the retro crap. Really the only one that pulled that off well was the Challenger, but maybe that's just me. Now you are getting personal! But that's the route I went.